(HOLLYWOOD, CA) - Dedicated to the premise that visiting Hollywood should be an experience equal to the emotion of meeting your favorite celebrities, Madame Tussauds (www.madametussauds.com) is where fans go to see and celebrate the legendary and illustrious. Authentic lifelike figures, interactive experiences, themed areas and the best in quality and immersive guest interaction are just the beginning of the Madame Tussauds Hollywood experience, which takes center stage in the entertainment capital of the world on August 1, 2009. Located adjacent to the historic Grauman's Chinese Theatre on Hollywood Boulevard, Madame Tussauds Hollywood (website) is an immersive attraction where guests can interact with their favorite celebrities without velvet ropes or barriers between them, stepping into elaborate interactive sets - as if they are playing the role of a supporting actor or actress - to create a truly unique guest experience. For 200 years as the touchstone for celebrity interaction, Madame Tussauds Hollywood is poised to become the premier guest destination in Hollywood when it opens a new $55 million dollar attraction to the public. 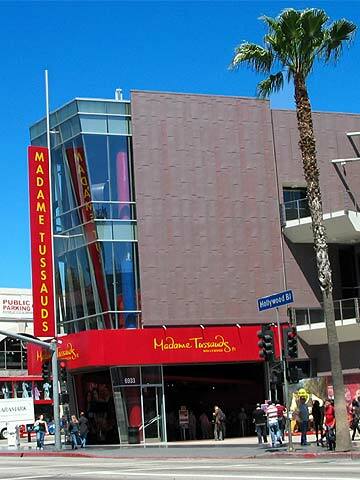 Upon arrival at Madame Tussauds Hollywood guests are immediately struck by the building's exterior, a continuous form of faceted planes sheathed in a glass skin with varying degrees of transparency depending on the time of day. As people move at all levels the transparent walls will create a moire' pattern while affording guests a spectacular view of the legendary Hollywood Boulevard which has itself undergone significant revitalization befitting the Madame Tussauds ambiance. The Madame Tussauds Hollywood experience begins when guests sashay down the red carpet, like at the Oscars®, on a unique and emotionally-charged journey where they can get up close, touch and take pictures with the stars of Hollywood. Spread over three floors and 18 themed zones, there will be plenty of surprises, phenomenon and some truly breathtaking experiences. A key component of the experiential nature of Madame Tussauds Hollywood is the interactive sets which are presented in special zones and offer a unique opportunity for guests to experience the glamour and glitz of Hollywood while traveling through themed areas including Hollywood's golden era of cinema, crime, westerns, modern classics, behind-the-scenes, science fiction, action heroes and more. The first-ever Madame Tussauds to be built from the ground up, Madame Tussauds Hollywood will feature more than 100 authentic, lifelike wax figures, half of which are unique to this attraction, and include famous icons Vivien Leigh; George Clooney; Beyonce' Knowles; President Barack Obama; Marilyn Monroe; Marlon Brando, Penelope Cruz; Jamie Foxx; Halle Berry; Clark Gable; Johnny Depp; Cameron Diaz; Justin Timberlake; Kobe Bryant; Hugh Jackman; Zac Efron and more. Los Angeles Mayor Antonio Villaraigosa recently commented, "Madame Tussauds Hollywood...will join the ranks of iconic attractions that draw visitors to Los Angeles from across the United States and around the world." When it opens in 2009, Madame Tussauds Hollywood will become the 9th museum in the Madame Tussauds world-wide portfolio, joining other locations in London, Amsterdam, Las Vegas, New York, Hong Kong, Shanghai, Washington, DC, and Berlin. 2009 also marks the 200th anniversary of Madame Tussauds which has played host to over one half billion guests.